I love boiled eggs, but I don’t like boiling them. I always get boiling eggs wrong. I’m clumsy to the bone, it’s not my thing to peel and boil eggs rara! 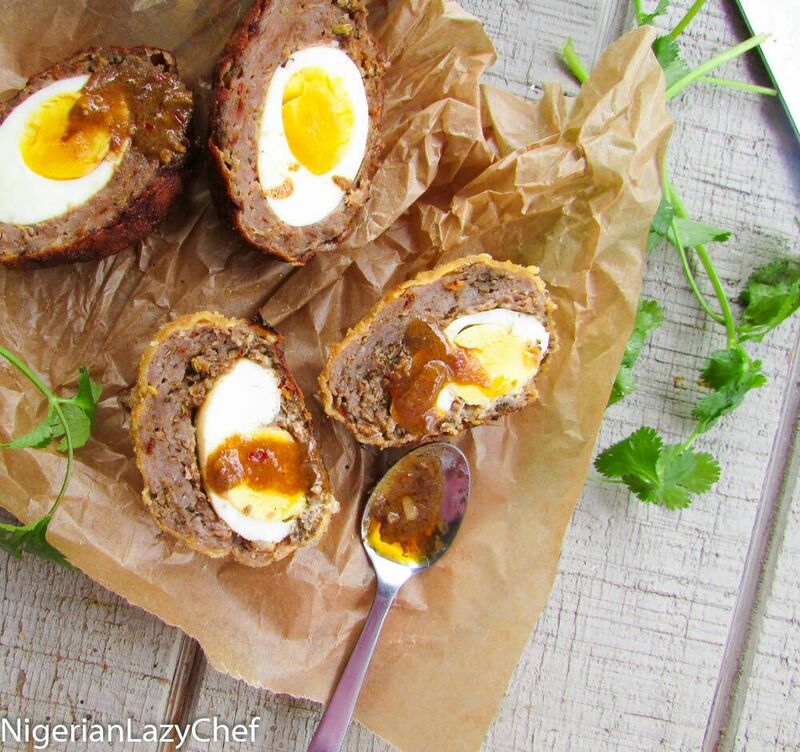 When I first found out about Scotch eggs, I thought they were the Nigerian egg rolls until I saw the texture. I absolutely love anything with eggs in them, so I set out to make some. Seeing as practice makes perfect, I perfected my recipe. 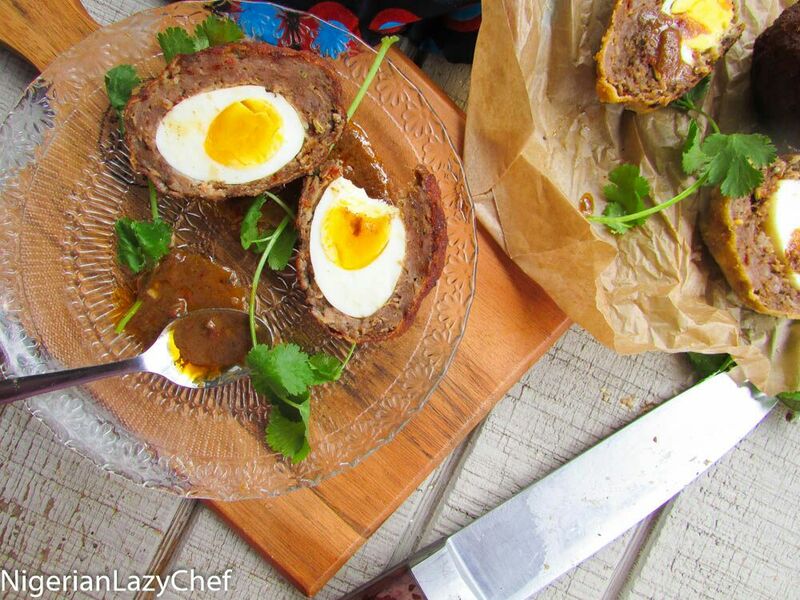 Scotch eggs are simply eggs rolled in sausage meat and fried or baked. I went with a more traditional method on this post; which is to fry then bake. Of course with my self on fit fam, I baked my own portion. Before the recipe, I would like to talk about something dear to my heart….and it’s about children. Some of us Nigerians, do not understand children. I feel we need to each take a class in early childhood intervention courses. There are things adults should not do; and challenging a little child is one of those things. It’s hurtful to go I front of a child and say things like “if you do this or don’t do that, I’ll beat the hell out of you.” When I heard these words spoken to a child by an adult, I was broken. I didn’t even want to know why the adult did such a thing. All I did was ask the Lord Jesus for Grace to ignore. Every university in Nigeria ought to have child hood intervention as a compulsory course attached to every major. We discipline our children angrily; therefore we raise angry children who raise more angry children, who raise angry children…. Now to the recipe. 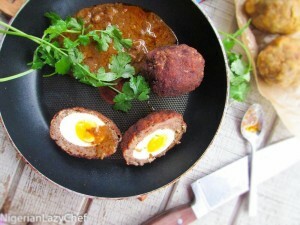 If you try these scotch eggs, you would understand why I love them so. The idea of using the suya pepper was totally genius. To my readers who are wondering what suya seasoning is, it’s to me what Cajun seasoning is to the natives of New Orleans. You may find it at any African shop. 1 chopped habanero(ata-rodo) if you want more heat. Remove the sausages from their casing. Add the suya seasoning, paprika, minced herb, chili flakes, and salt to taste (Although not compulsory); then mix into the sausage meat without over working the meat. flatten a chunk of the meat mix enough to cover one egg to about a quarter inch thick. Mold the meat around the egg(making sure to dip the tip of your fingers into the water to prevent it from becoming sticky to the feel). Roll the covered egg in between your hands to shape; then set aside and repeat the process for each egg until done. To prepare for frying, have four bowls ready. One with the ½ cup of corn meal, one with the eggs, one with the 2cups of corn meal. Preheat oven/oil to 300-350 degrees. If you do not want to use an oven, you could fry the scotch eggs until golden brown and serve. If you are on #fitfam, you can bake the scotch eggs for about 10minutes on 350 degrees. This entry was posted in Appetisers, Appetizers, baking, Eating Healthy, Egg rolls, Eggs, gluten free nigerian recipes, Gluten free recipes, Healthy Eating, healthy holiday recipes, Healthy Nigerian, Healthy Nigerian Dishes, Holiday recipes, Nigerian sauces, Nigerian small chops, Nigerian snack, Nigerian Snacks, Nigerian Suya, Sauces, Street food, Street Snack, suya, Uncategorized and tagged gluten free scotch egg recipe, Nigerian food blog, scotch egg recipe, Suya pepper scotch egg recipe.